I saw a midnight screening of House of Flying Daggers at the New York Film Festival Saturday night. While walking into the theater, I saw a pseudo-red-carpet alley being formed by throngs of people. I went over to see what the commotion was about, thinking that there was no way it could be...and it was. Zhang Ziyi. She is stunning. Some people never lose the skin they had as a baby. I had an urge to reach out just to run my fingers across her cheeks, but then I remembered that I'd probably get tackled and beaten by a few aspiring Vin Diesels, and I still did want to see the movie. Director Zhang Yimou also walked in. Both of them received a Cannes-lite reception. Inside, Zhang spoke a few phrases which were translated into English. He mentioned that he was almost too intimidated to attempt a bamboo forest fight scene after Ang Lee's success with the same in Crouching Tiger, Hidden Dragon but that he was pleased to have found a unique way to shoot it which he hoped we'd enjoy. Zhang Ziyi came out to the crowd's delight and said in shy, halting English, "Thank you for coming. Please enjoy the movie." I've never seen a movie at Alice Tully Hall before, and especially since my seats were in the back row, I wasn't too hopeful about the acoustics and picture. I was wrong. As the picture came on screen, a huge drum sounded, and it was LOUD. No surround sound, but the acoustic picture in the front half of the theater was distinct and LOUD. I was so pleased, because as the movie progressed, I realized that the sound design and soundtrack of the movie are critical to its effect. The sound of drums shaking the air, the whisper of silk fabric sssssliding across itself, the whistling of (flying) daggers slicing through the air, of leaves rustling as horses or soldiers rush past...all of them came through crystal clear. As with Hero and Raise the Red Lantern, Zhang favors lush, saturated color palettes. The scenery, shot in parts of the Ukraine and China, is gorgeous, and the actors outfits are often coordinated to the environment. When Zhang Ziyi dances at a brothel, her blue dress complements the hall decor. When she's running through an autumn forest, she's dressed in muted navy and gold, and near movie's end, when she's in a forest of bamboo and leaves, her spring green robe blends in such that an interior designer would be proud. Those ancient Chinese had great fashion sense. The finale brings together all the color palettes from the movie and highlights them against the neutral backdrop of a white snow-covered landscape. The House of Flying Daggers is a clandestine rebel group that steals from the rich, gives to the poor, and combats the waning Tang Dynasty government. Leo (Andy Lau) and Jin (Takeshi Kanehiro) are two soldiers in the General's Army, given the assignment of capturing the new leader of the House of Flying Daggers in ten days. Jin, a ladies man, is sent undercover to the Peony Pavilion, a brothel, to investigate and win the heart of a new blind dancer, Mei (Zhang Ziyi), rumored to be a member of the House of Flying Daggers. Anyone who's seen Crouching Tiger, Hidden Dragon or Hero or any of the classic wuxia movies will realize that to summarize any more of the plot would be difficult. Wuxia movies always involve complex, labrynthine plots full of double crosses and shifting loyalties. Whereas the characters, love stories and, combat in Hero felt so ethereal and mythic and pure as to be constricting and suffocating, HOFD contains more humor and humanity. Jin and Mei, both played by real life heartthrobs, flirt and laugh, a refreshing change from the formal, muted romances between Chow Yun Fat and Michelle Yeoh in Crouching Tiger, Hidden Dragon or Tony Leung and Maggie Cheung in Hero. The scale of the story also stays at an individual level, focusing on Jin, Mei, and Leo, instead of rising to the level of a national epic. The combat is somewhere between that of a Crouching Tiger, Hidden Dragon, where characters could fly, and a Bruce Lee movie, no wires required. The warriors in HOFD can certainly leap in a manner that defies physics, but not so much that they seem superhuman. In Manhattan, they'd still have to take the subway to get from downtown up uptown. More importantly, the combat has force and impact. Characters bleed and sweat and stumble in the leaves and snow. Not that there's any shortage of the balletic. As in CTHD, there are battles set at treetop level in a forest, and a fight that soars up and down stalks of bamboo. Yimou uses a combination of special effects shots and wire work to achieve some lyric shots. Overhead shots frame Mei's acrobatic backflips, and the bullet-cam shots so popular with John Woo allow the camera to circle and follow daggers and arrows as they rip through forests and over fields of wildflowers, traveling impossible distances to slice and stab their targets (Jin is Aragorn with the sword, Legolas with the bow and arrow). It's technically ravishing. The acting and dialogue are true to the wuxia tradition which is both a strength and a limitation. Wuxia movies won't ever provide the type of dialogue or elicit the type of acting that wins Oscars. It takes a game actor to keep a straight face pronouncing some of this dialogue, and it's even more difficult for the audience to keep a straight face listening to much of it (the subtitling was actually quite good, even if it failed to convey bits of nuance here and there). 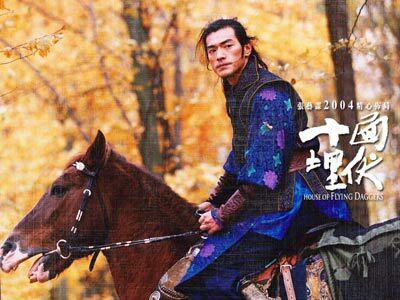 Some people find the chivalry and heroism of wuxia movies touching, and others hokey. HOFD is not as geniunely moving as the pictures Yimou made with Gong Li, but the emotional hooks dig deeper than those of the typical swordplay movie. At the very least, Lau, Kanehiro, and Zhang are a handsome group, even when their faces are frozen in the wuxia tragic mask--expressionless, stoic, as a tear runs down one's cheek to hang for dear life at the corner of one's chin.